Our kids are OBSESSED with penguins. They have penguin stuffies, penguin books, and penguin games. So when C turned 5 and we asked him where we should travel to that year, we were not surprised when he screamed out “PENGUINS” at the top of his lungs! That was that. So, we began looking for where we could most easily visit these fantastic birds. After some research, we learned about Punta Tombo in Patagonia. 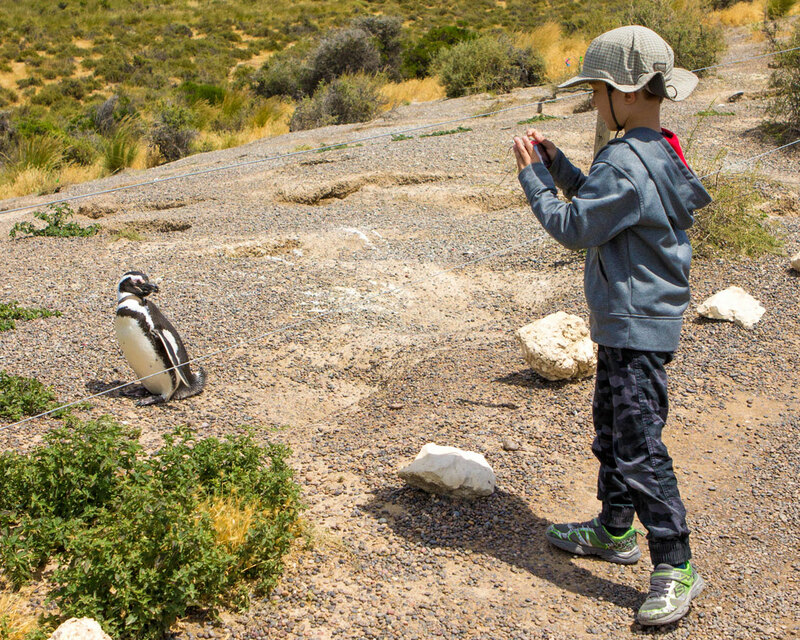 With the world’s largest population of Magellanic penguins, it looked like we would be visiting penguins in Punta Tombo, Argentina with kids! Check out our video for all the action. Subscribe so you can see all our latest videos! 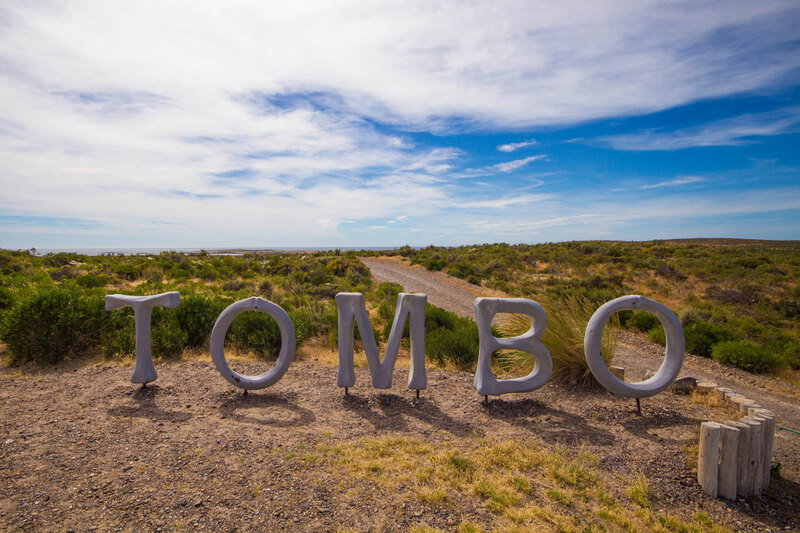 Where is Punta Tombo, Argentina? The Punta Tombo peninsula juts into the Atlantic Ocean, 110 km from the city of Trelew in Chubut Province Argentina. We joined Say Henque, a local tour company from our base in Puerto Madryn. We were picked up for the 3-hour drive to the penguin rookery in Punta Tombo. The long drive gave us a chance to catch up some rest. But the drive wasn’t without its excitement. Along the way, we saw some incredible wildlife such as Rhea, Hares, Hawks and more! We pulled into Punta Tombo at the Interpretation Center (Centro de Interpretación). The museum itself is small but packed full of incredible information. 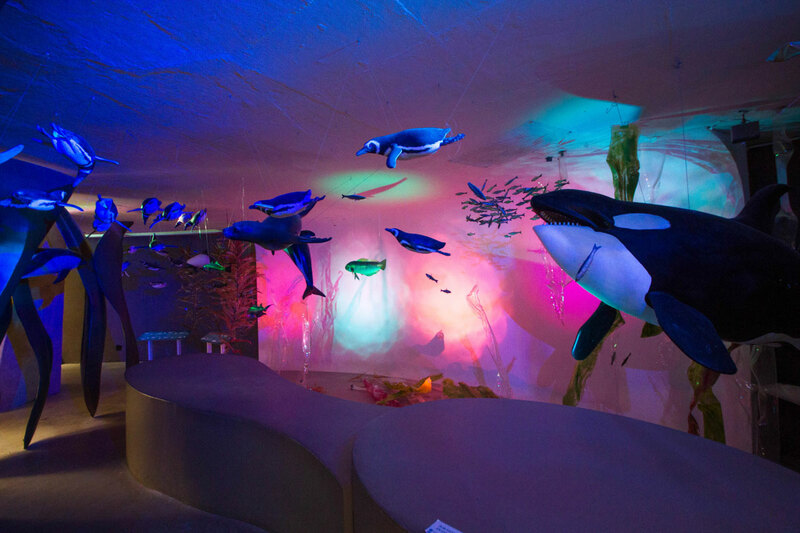 The Interpretation Center features colorful displays of local ocean and bird life. They are set up in a way that dazzled the minds of our boys as they wandered the halls. They were especially fascinated with the maps of all the major penguin colonies throughout the world. Look at all the places we still need to visit, commented C.
Pro-Tip: The Interpretation Center has a small restaurant and bar. It is the only place in the region where you can buy food and drinks. So if you forgot to bring some, load up on supplies here. The closer that we got to the rookery in Punta Tombo, the more excited the boys got. As we made the final 5-minute drive from the Interpretation Center to the penguin conservation area, it was all we could do to keep them from running through everyone’s legs to the door of the van. True to form, C was right up front and center as our guide gave us all the details that we needed for our visit with the penguins in Punta Tombo. He even skipped off ahead of us just so that he could walk alongside her and soak in as much information as he could. As our visit coincided with the end of nesting season, we had the additional benefit of getting to see some adorable penguin chicks! 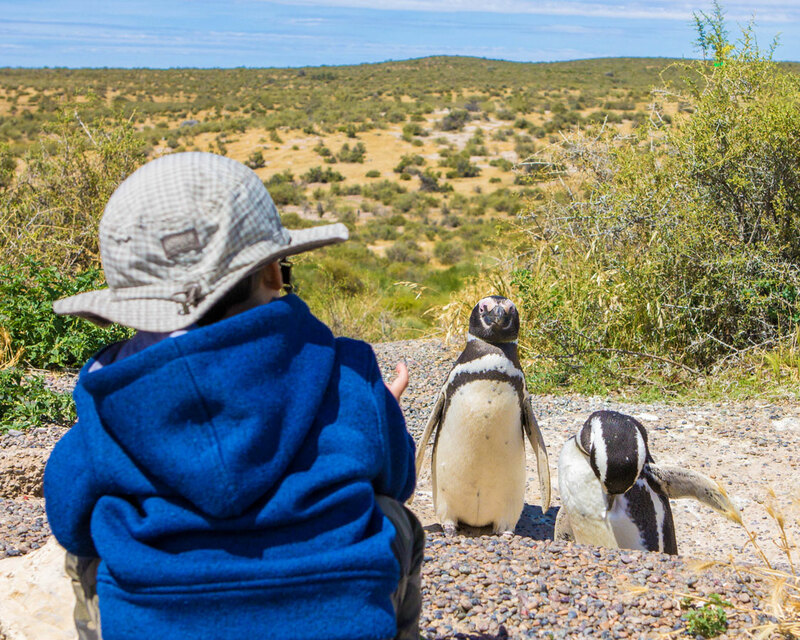 Punta Tombo is home to the largest continental colony of Magellanic penguins in the world. Every year, between September and April, nearly one million penguins make their way to the rocky shores here to nest and bear their young. 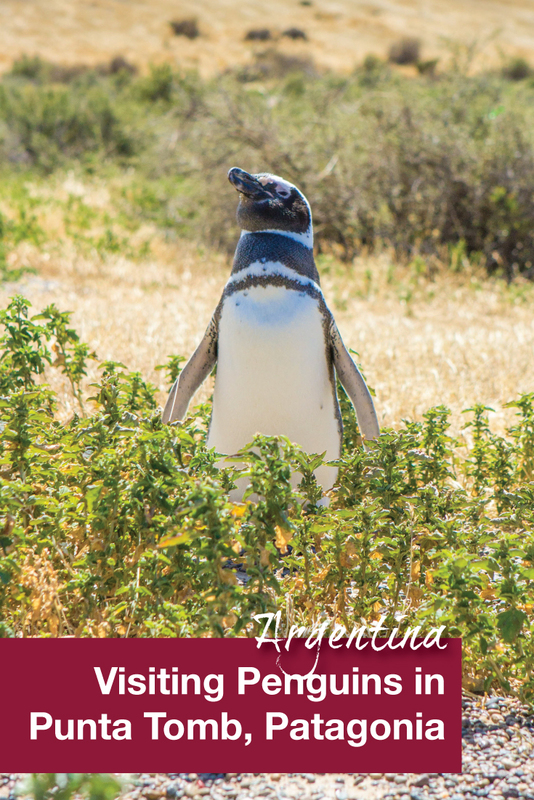 Because of its location, it is one of the most easily accessible penguin colonies in South America. Because of its popularity and accessibility, there are a few rules in place that visitors must follow. 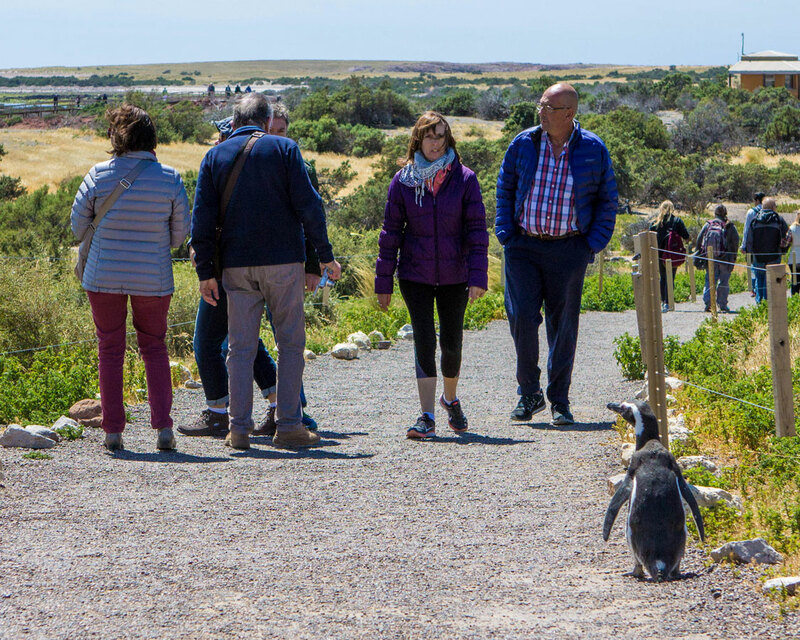 Getting around the penguin rookery in Punta Tombo is a breeze. Visiting the accessible areas of the whole conservation takes about 3 hours. This isn’t because it’s that long or vast, but because you’ll stop every 15 seconds to gaze at yet another goofy penguin doing things that goofy penguins do. And you’ll love every second of it. The paths throughout the conservation area are well marked and accessible. They’re a combination of limestone paths marked by wire edges, wooden boardwalks, and bridges that allow the penguins to pass undisturbed below. Because penguins nest in burrows dug in the ground, it’s important to remain on the paths. Seeing them in person, it’s easy to see how easy it would be for the burrows to be destroyed under the weight of a careless explorer. Magellanic penguins retain their mates and their nests for life. They work year after year building the perfect home for their chicks. 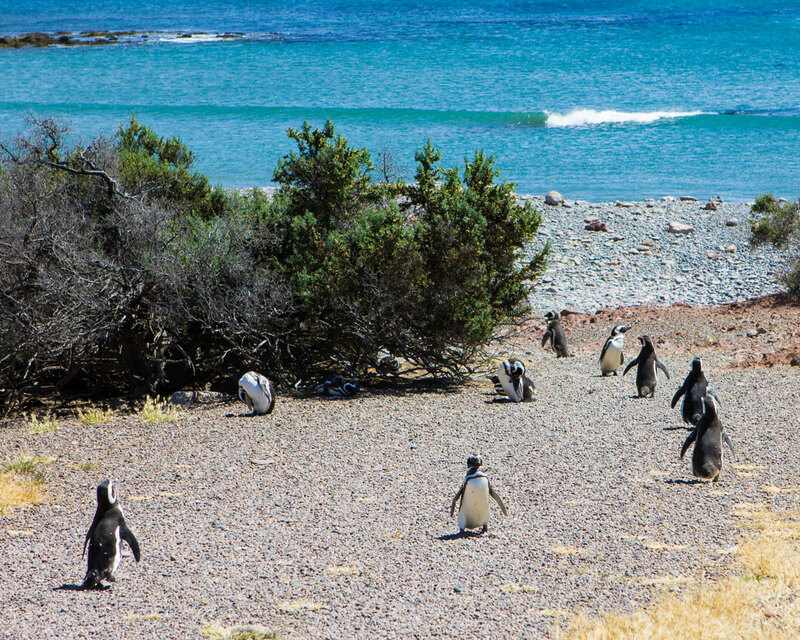 About half way to the cliffs overlooking the beach sits one of the best vantage points to watch the Magellanic penguins. The bridge sits right where hundreds of penguins hilariously waddle towards the beach. I called this spot the Penguin Superhighway. We could have spent hours watching these little guys make their way up and down the path. We continued on to the boardwalk that offered sweeping views of the rocky beach. This is where the penguins made their way for some fun splashing in the waves. It would have been nice to have an opportunity to see them closer up. But the beach is pretty far from the boardwalk. Nonetheless, it was great watching these little guys diving and fishing in the cold Atlantic waves. The boys were having so much fun watching them, that they even got along for a little while! We had reached the furthest point in the conservation area, and as we turned to make our way back. 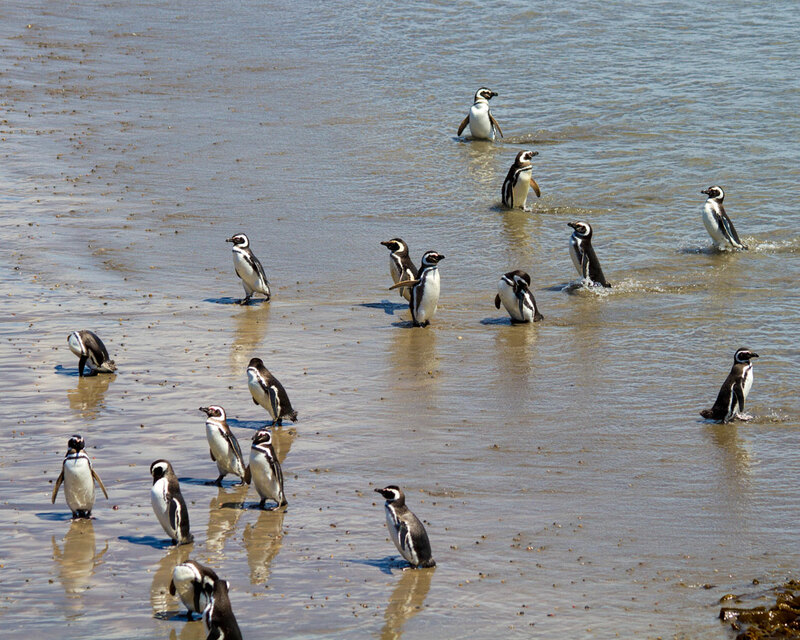 I looked out across the plains and saw a sight that brought home just how many penguins made Punta Tombo their home. 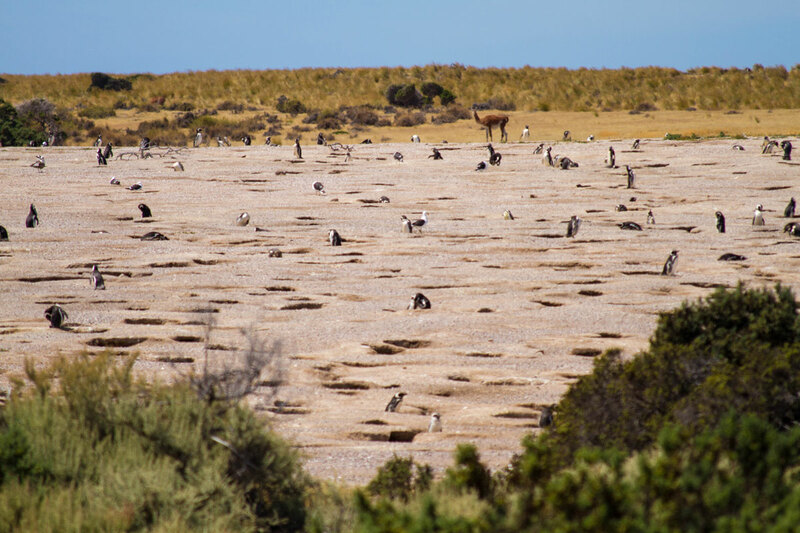 A field, filled with penguins and their burrows, with a single lonely guanaco off in the distance. 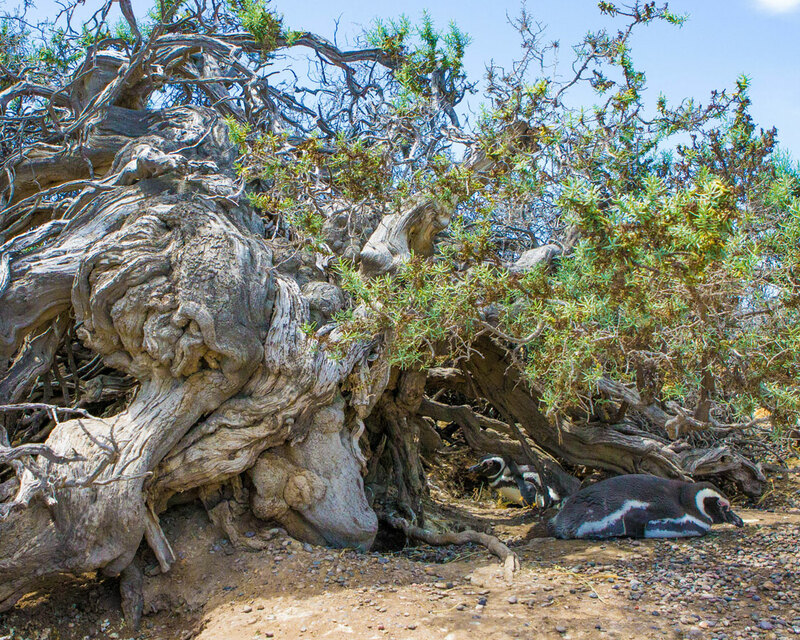 Many of the penguins who hadn’t completed their burrows found shade from the midday sun under incredibly gnarly trees. These natural shelters made for perfect spots for the snoozing birds and would often have several of them curled up underneath. Those who couldn’t find room under the trees or in burrows of their own looked for shelter anywhere else they could. Some found it under the boardwalks and bridges of the walking paths. Others settled for the bit of shade offered by the benches that offered visitors a place to rest their legs. Near the end of the boardwalk came C’s crowning moment. This little man has taken his penguin puppet Meep Meep (Named after the sound the children’s show penguin Pingu makes) with him on almost every trip that we’ve ever taken. 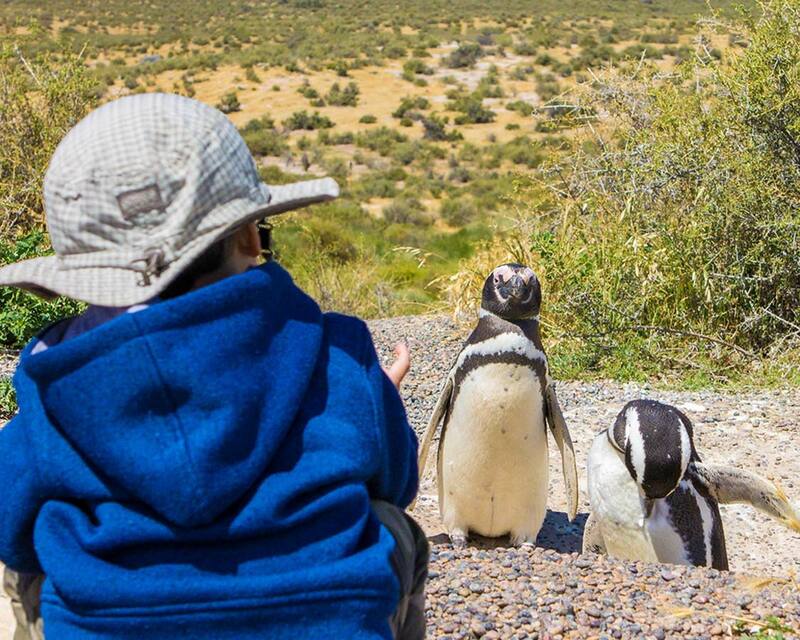 Some curious penguins approached him. We had finally pried him from the hip of the guide got a great shot of him hanging out with his spirit animal! 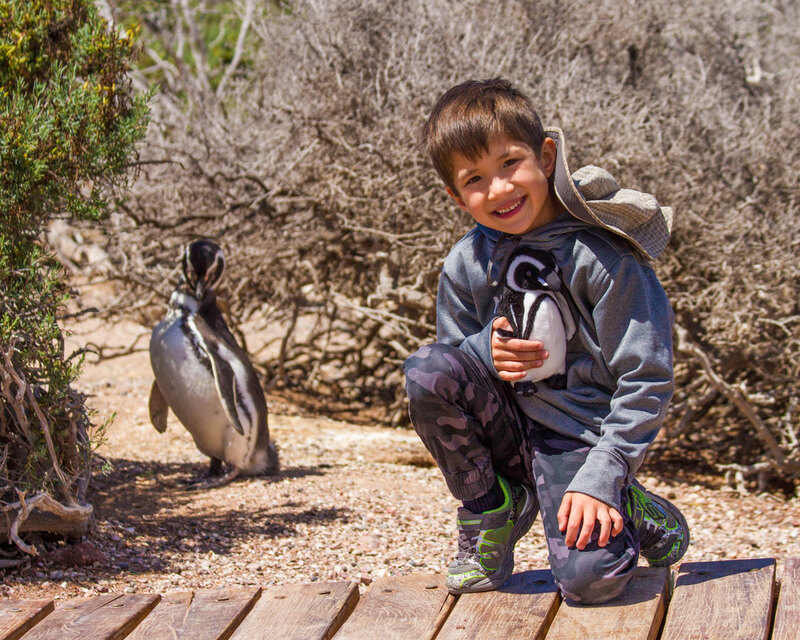 Visiting Penguins in Punta Tombo with our kids was one of our most special family adventures. It was the first destination that our kids picked and were we ever glad that they did. It only served to increase their love for these amazing little birds and gave us a memory that is unforgettable. As we returned to the van for a stop in Trelew before heading back to Puerto Madryn, we couldn’t wait for the next adventure that Argentina had in store for us. We would be returning to Buenos Aires for a trip along the Delta Parana in Tigre. Oh my gosh, this was a delightful read. How incredible that your kids (and you) got to mingle with all these penguins. And there are so many living there. I liked seeing their little habitats as well as their wandering areas. The photos are really fun and I smiled while reading the whole article. Well, that is the coolest thing I’ve seen today! Penguins are too darn cute. I’ve got to make it here someday! This is so different from how I expect to see penguins. 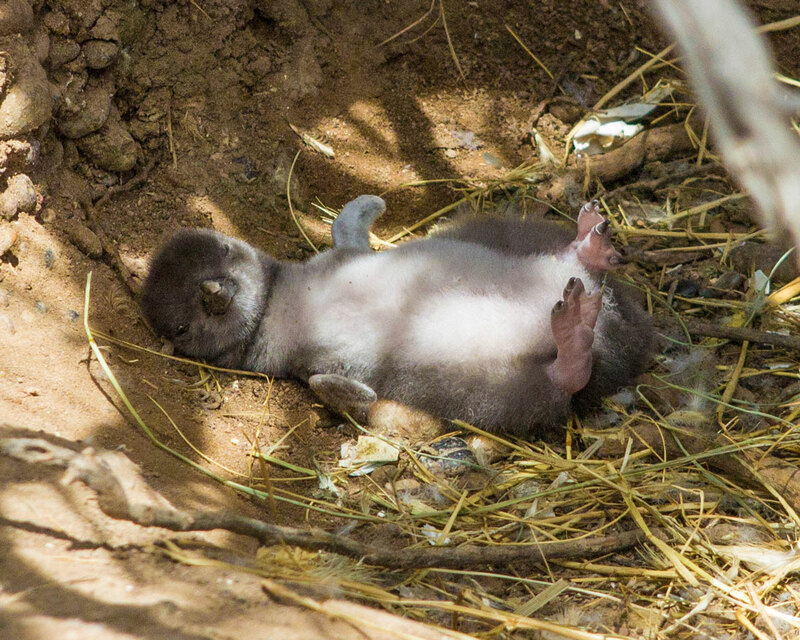 It’s just like the exhibit of the Argentine penguins at the Woodland Park Zoo in Seattle, which makes me feel a little better about their efforts. What a cool experience for the kids. It’s pretty cool to see them outside of the icy environments that they are always depicted in! Such a lovely post! You don’t have to be a kid to love those penguins! That’s amazing! I would never have expected to see penguins, in what looks like a very dry coastal area. what a fabulous experience for kids! Great post. This looks like an awesome experience for the little ones! What an incredible experience not only for the kids but the kids at heart too! I couldn’t believe that they were on your path as you’re walking – so casual – walking along with penguins! This is reason alone for me to add a visit to Punta Tombo to my “someday list” and you’ve inspired me to go #MakeSomedayHappen. Thank you! What a fun experience. Looks like Meep Meep had fun as well. I’ve never thought about penguins lying under trees, as I’ve always seen them in or near water. This looks incredible. Then I got to the baby and was like, that’s it, when can I book this?! Thank you for such a wonderful write up and promoting a place that promotes ethical viewings of wildlife. Teaching the younger generation that it’s not all about touching, riding or watching a show is invaluable to the future. Love the pictures too!! Thank you very much! It is very important to us to show our boys that we can live in harmony with nature. I love penguins too, but have never seen them outside of a zoo! These photos are so cute. Incredible to come across your article. 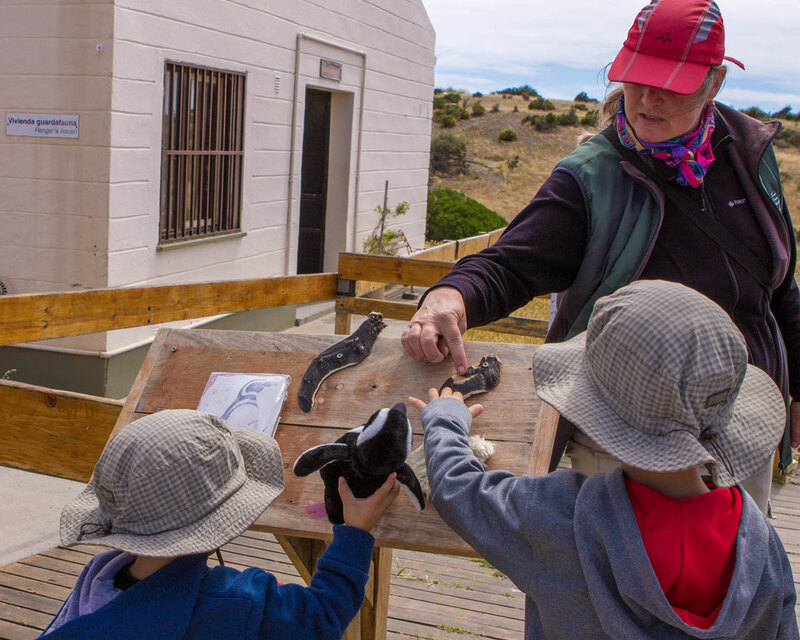 Was a pleasure to share the trip to Punta Tombo with you and the kids. hope you can come back sometime!!! Mary your guide to Punta Tombo. Thank you so much for visiting. We had such a wonderful day with you. I can clearly remember C walking at your heels and taking in every single word you said about his favorite animal.